Compact design to provide full support to the lower arm. Available in five sizes so that it is best for arm injury relief in all age groups. Made with advanced technology at a licensed manufacturer unit. Breathable material allows the patient to enjoy pain relief comfortably without the arms becoming sweaty. 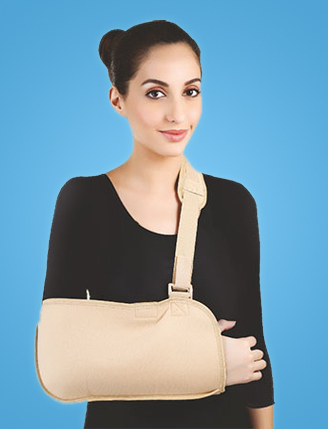 Simple arm sling design supports the brace with an adjustable broad neck support. Separate thumb rest allows for maximum relief when complete movement restriction is necessary. Separate broad shoulder pad for easy carrying. Please refer to circumference table to place orders for the right size fitting. Consult our customer support if you are unsure about the right size. Read package instructions carefully on receiving the order. Take help from someone to set the brace and strap around the injured arm. Adjust shoulder/neck strap length to a comfortable fit. Use it constantly to provide maximum rest to the injured arm. It is a therapeutic accessory that should only be used followinga recommendation from a licensed physiotherapist. Make sure that no one except you uses the product casually as it can alter the adjustability with your body. Try to wear it over a full sleeve shirt instead of using it on bare skin. This helps the Arm Sling from getting dirty quickly. Keep it clean to prevent accumulation of germs on the fabric. Alter the belt adjustment according to the progress of your recovery. Clean the Arm Sling with a wet cotton swab regularly. It can be machine dried, but it is advisable to hand wash in warm soapy water for longevity. Prefer sun drying instead of machine drying. Try to move your arms as little as possible. The practitioner will suggest when you can replace the Arm Sling with a wrist sling allowing greater flexibility to the arms. Use of thumb rest is optional and depends on patient discretion. The arm sling is used for all kinds of arm pain relief as long as you are able to fold from the elbows. Certain types of pains in arms are caused due to neural reasons. The sling may not be a sufficient accessory in these cases. Consult a specialist to evaluate its possible benefits even then. It is beneficial for treating fractures, sprains, and injuries of all kinds. Having the product at home can provide first aid benefits to anyone receiving a sudden injury at the arm. Athletes and sportsmen involved in games such as volleyball and basketball can use it for resting their arms between training sessions. In case of fracture or broken bones, you can use it over the plaster cast for optimum comfort. The doctor would suggest you to wear it for some time even after the cast is taken off. Kids are particularly prone to arm injuries. The various sizes make it easy to find a right one suitable for a child. Beneficial for seniors suffering from weak bones due to aging. It eventually releases you from painkiller dependency. These pills only provide temporary relief and grow tolerance levels very fast to cause addiction. The arm sling is a fantastic support accessory for treating lower arm injuries. This portion of the body is a common region to receive the impact of a fall. Since the hands are among the most mobile portions of the body, complete rest is necessary for the relief.